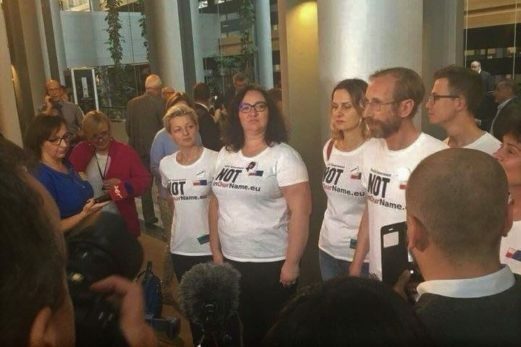 NotInOurName – Europo, nie odpuszczaj! Article 2 TEU:„The Union is founded on the values of respect for human dignity, freedom, democracy, equality, the rule of law and respect for human rights, including the rights of persons belonging to minorities. These values are common to the Member States in a society in which pluralism, non-discrimination, tolerance, justice, solidarity and equality between women and men prevail”. Open Letter of the top European legal and constitutional scholars to Vice-President Frans Timmermans:“If the law on the Supreme Court enters into force in the beginning of July, as is currently planned, a large number of sitting judges of that Court will see their tenure unconstitutionally extinguished. In combination with an increase in the number of seats on the Supreme Court, this means that the newly politicized National Council of the Judiciary, elected by the governing party, will be in a position to appoint a majority of the judges on the Supreme Court. We believe this to be in direct contravention of the rule of law, which is proclaimed as a core value of the EU in Article 2 TEU, and of the fundamental requirement of the independence of the judiciary which is a key component of the rule of law”. After 2 years of the Law & Justice party’s rule, we can be absolutely sure that there exists no such institution of a democratic State that the current authorities, in spite of not holding a constitutional majority, would not be able to destroy or turn into a façade. For a huge part of Polish society, the current government is that of a constitutional junta, which is demolishing the Polish State’s democratic foundations without having any title to such action that might have resulted from holding a constitutional majority, nor – contrary to its statements – does it hold the mandate arising from the election process. None of these so-called reforms of the judiciary system being imposed in breach of the constitution, often under the cover of night and against the legislative procedure was part of the party’s election programme, and so of a wider public debate. Systemic projects are submitted by the current authorities not even as governmental initiatives, but as initiatives of a group of a dozen or so MPs, and as such avoid the requirement for any social consultations whatsoever. Participants of street or ecological (the Białowieża Forest) protests are in mass numbers faced with prosecution or police accusations, the purpose of which is to discourage society from active opposition and what is more important – this criminalizes all and any acts of civil resistance. Even with regard to such a simple issue like using a loudspeaker during a protest, the authorities consider it appropriate to reach for regulations on environmental protection to punish the person using the loudspeaker. Other blatant examples of the authorities’ abuse of power are cyclically observed and reported, among others, by Amnesty International observers. Social protests, civil disobedience acts are not enough. We joined the EuropeanUnion because we shared common values and common beliefs about the fundamental superiority of human and civil rights which are accompanied by the progress of civilisation thanks to a budget and initiatives. In exactly such order. Not the demands for higher pay of the first Solidarity constituted the foundation of that legendary movement with 10 million members, but the widest understanding of human rights as the foundation of all other rights –including the right of association. We, who are representatives of a civil society need not be reminded of those values because we have been defending them on the streets of Polish cities for over two years now. But we want to be sure that you remember them the same as us. Free and independent courts, independent judges are the sole guarantee that for us, just as for the remaining EU countries, is the guarantee to uphold the community of values and a European legal order, regardless what the representatives of the constitutional junta will be saying because they are not saying it in our name. According to Article 183 section 3 of the Constitution of the Republic of Poland directly applied under Article 8 section 2 of the Constitution of the Republic of Poland, Professor Małgorzata Gersdorf, PhD, D.Sc. shall remain the First President of the Supreme Court till 30 April 2020. The government’s introduction of art. 111 § 1 of the Law on the Supreme Court dated 4 July 2018, which will remove from the Supreme Court a substantial number of judges shall be in breach of art. 180 part. 1 of the Constitution of the Republic of Poland which states that – Judges shall not be removable. The change is a clear violation by the legislative powers of the guaranteed independence of the judiciary. Judges who have started their service in the Supreme Court prior to entry into force of the Law dated 8 December 2017 on the Supreme Court should continue their service till they reach the age of 70, without satisfying any whatsoever additional conditions that have been imposed by the Law & Justice government. Even in Hungary governed by Viktor Orban, who did have constitutional majority and changed Hungary’s Constitution in a way that transformed the Hungarian Supreme Court into a different institution with identical competences – the attack on the term of office of the President of the Supreme Court failed – such was the verdict of the European Human Rights Tribunal (Baka vs Hungary). Shortening the term of office of the Hungarian Supreme Court’s President was unlawful. In Poland, the Law & Justice Party, which does not hold a constitutional majority, has since 2015 been ruthlessly demolishing the current institutions which guaranteed a constitutional order, lawfulness and adherence to human rights – and this is happening not by changing the Constitution but through ordinary Laws – including the Law on the Supreme Court, by shortening the term of office of the President of the Supreme Court and by sending into retirement those judges (in spite of the constitutional rule about their irremovability), who have exceeded the retirement age currently set by the Law & Justice government. Prime Minister Morawiecki has a number of times drawn on an false argument that all changes concerning the Polish judiciary system are the result of necessary procedures the aim of which is to remove from the Polish judiciary system judges with a communist past. I wish to remind that communism ended in Poland in 1989. That was 29 years ago. Discussion with populists or propagandists ends the moment you reach for source data. So let’s move to specific facts: Already 6 years ago „the most numerous group in regional courts were those judges who were working between 10 to 20 years (36%) and those with work experience between 5 and 10 years (31%). With regard to district courts, the most numerous group of judges there had work experience between 10 and 20 years (43%). This can be easily explained if you consider that in 1989, there were about 4 300 judges in Poland and now, there are 10 600 justice posts. The number of judges has doubled over the past 20 years. The justice personnel is relatively stable as can be seen in the high percentage of judges with at least 10 years of experience in the passing of sentences (in total, incl. the period of counselling/assisting judge). Data regarding the length of time in work in case of judges of administration courts (…) shows a relatively high number of judges with short time of work experience in the post of judge (between 5 and 10 years– 39%). In military courts, like in the common judiciary system, judges with work experience between 10 and 20 years prevail (43 %) or between 5 and 10 years (29%), and this brings this group close in its composition to the ratios which characterise regional court judges. Also in case of these judges, their specificity had not been taken into consideration and because of the small numbers of those judges, the total numbers given concern both garrison and district courts” – report regarding the state of the judges (in polish) . So in face of these numbers, what is this communist heritage that Prime Minister Szydło talked about earlier, and then Prime Minister Morawiecki, and President Duda, and Jarosław Kaczyński? In January this year, Prime Minister Morawiecki again reached for the rhetoric of lies insinuating that judges of the Supreme Court „were involved in passing firm, politically rooted sentences during the Martial Law in the 1980s, while others remained secret informants of the communist secret service and their lasting presence in the Supreme Court and the influence they have over it had impacted negatively on the level of social trust towards the judiciary and well as on the actions of younger judges”. 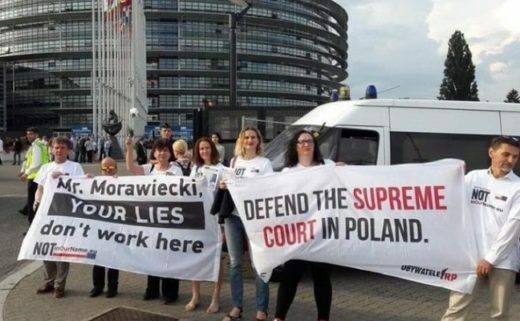 Morawiecki’s statement was disseminated among foreign press journalists and was intended to justify the exchange of judges of the Supreme Court. It is needless to say that even today, when Prime Minister is asked about specifics, he wouldn’t be able to point to even as little as 5 judges who are active judges of the Supreme Court and whose paths in life and the choices they made would match this supposed bleak condition of the Polish judiciary carrying on its back such a shameful dark heritage. Assuming that the Law on Supreme Courts should enter into force in its full version, we will be facing a situation when only 45 percent of the current Supreme Court will be passing sentences, while the remaining selected judges (up to 120) will in fact be party judges. And when looking at the actual choices made by the current ruling Law & Justice party, we can in fact expect the return of communist ghosts au rebours – because the „face” of the legislative changes in the Supreme Court (the same one that was behind the legislative process which destroyed the Constitutional Tribunal and the National Council of the Judiciary) is none other than Stanisław Piotrowicz, a zealous prosecutor from the Martial Law period who during the times of the communist Polish People’s Republic actively persecuted the anti-communist opposition. Oko.press: Taking control over the Supreme Court will allow PiS to control all the courts, the media and the elections results.